Those at extended campuses or who otherwise cannot attend next week's Teaching Festival will be able to see highlights and interact with presenters during a webinar on Feb. 25, 5-6 p.m. The 2016 Teaching Festival will be held Feb 15-19 at Webster University's home campus in Webster Groves. You can RSVP to attend the teaching Festival in person by clicking here. 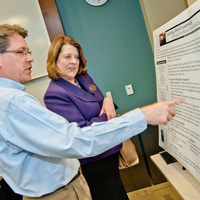 The Teaching Festival showcases a variety of events related to the scholarship of teaching and learning. It is hosted by the Faculty Development Center in collaboration with the Online Learning Center and University Library staff and is facilitated by Webster faculty, staff and students on campus. If you are unable to attend in person we invite you to join the webinar on Feb. 25, 5-6 p.m. CST showcasing "2016 Teaching Festival Highlights." We will watch short interviews with several of the presenters and several will be live with us that evening to speak about their sessions. Safe Zone Workshop which is defined meant to educate individuals on LGBTQ issues and help members of college communities (students, professors, administrators, and staff) become better allies to LGBTQ students and more aware of gender and sexuality issues. Registration is required for this event. You can register for the webinar here. This session will be recorded for later viewing and posted in the Faculty Knowledge Center. If you have any questions please feel free to contact Tyann Cherry at cherry@webster.edu.